Your order will be filled on a first-come-first-served basis. The Zhiyun-Tech CRANE 3 LAB Creator Package includes the CRANE 3 LAB gimbal and dedicated accessories that allow for an optimal workflow with the gimbal. The CRANE 3 LAB supports up to 10 lb and features a standout design with a top handle. This handle provides an additional point of stability as well as an easy way to switch to inverted mode. In addition to the accessories that come standard with the CRANE 3 LAB, such as a mini tripod, the Creator Package also includes a quick release baseplate, telescopic monopod, focus/zoom servo kit, two quick setup adapters, a phone holder, and a multifunctional camera belt in size large. The baseplate lets you easily move your camera between the gimbal and the hanging straps provided on the camera belt. It accepts the gimbal mounting plate on one side and latches onto the straps on the other. The idea is that when you pack away your gimbal, you can leave your camera out for easy access without having to remove the gimbal plate. The monopod is designed to secure to a quick release receptacle on the camera belt and allow for more stable jib-style shots, with the weight of the gimbal taken off your hands and supported by the belt. Even without the belt the monopod can be used as a comfortable extension. The servo kit consists of the Max and Lite motors for the CRANE 3 LAB. The gimbal supports two motors at the same time, so both can be mounted to control focus and zoom. The Quick Setup Adapters let you attach the mini tripod or monopod to the bottom of the gimbal by quick release functionality, instead of having to screw it in each time. And the phone holder will hold your smartphone on the side of the gimbal for monitoring. It supports up to 6.3" phones and can be articulated forward and backward as well as folded up when not in use. Please see a full description of each packaged item below. The Zhiyun-Tech CRANE 3 LAB takes gimbal design in a different direction with the addition of a handle on top. With an included mini tripod attached on the bottom and this fixed, ergonomic handle on top, the CRANE 3 LAB can be used two-handed for optimal stability. Moreover, the handle enables you to seamlessly switch to underslung mode, whether with one or two hands, and achieve creative shots such as 360° roll shots as you move closer toward a subject. In addition to this innovative design, the CRANE 3 LAB also packs other advanced features, such as wireless video transmission, and provides the ability to stabilize up to 10 lb loads. The CRANE 3 LAB supports two optional servos at the same time for focus and zoom control directly from the handwheel on the side. At the same time, all the other controls you need are provided at your fingertips at the top of the handle along with an OLED status screen. Additionally, the included ZY PLAY iOS/Android app (free download) provides many of the same control functions as well as special features such as panorama, focus time-lapse, motion time-lapse, long exposure time-lapse, camera settings, and more. Wireless transmission is achieved via a Wi-Fi connection to an iOS/Android phone or tablet. The CRANE 3 LAB wirelessly transmits your video recording from your camera to your mobile device in real time in 1080p resolution. This feature is compatible with select cameras; please see the Zhiyun-Tech website for a full camera compatibility list. Zhiyun's LAB series was released along with an ecosystem of optional, dedicated TransMount accessories. One of these is the TransMount Phone Holder, which allows you to mount your phone on the side of the gimbal for monitoring your shot via the ZY PLAY app. Other accessories include a camera belt, specialized monopods that work together with the belt, and the TransMount Quick Setup Adapter, which lets you attach the included mini tripod by quick release functionality. This same adapter can also be used to attach monopods to the bottom of the gimbal for more stable jib-style shots. If you get two of these adapters, you can easily swap a monopod and a mini tripod on the spot as your needs require. Another major feature of the gimbal is an axis latch lock system consisting of a separate latch lock on each axis. This feature allows you to lock the individual axes to remember your balance positions when powering the gimbal off. This way you won't have to rebalance each time. Note: The CRANE 3 LAB doesn't support many 3rd-party 18650 batteries because it requires the slightly shorter kind made by Zhiyun-Tech, so only Zhiyun-Tech 18650 batteries are recommended. An ergonomic handle on top, used with a mini tripod attached on the bottom, allows two-handed operation plus easy switching to underslung mode. Two optional servo motors can be mounted on the CRANE 3 LAB at the same time for focus and zoom control directly from the handwheel on the side of the gimbal. Zhiyun offers two dedicated motors, the TransMount Max and TransMount Lite servos. The Max version has enough torque to handle zoom and focus control, while the Lite version provides the torque for focus control. If you'll be switching one motor between zoom and focus control, the Max version is the one you need. But if you'll be mounting two motors at the same time, then a combination of one Max and one Lite version is the recommended solution. Featuring aviation grade motors and a different gimbal design, the CRANE 3 LAB achieves 50% noise reduction and 100% increase in motor torque over Zhiyun's previous models. The CRANE 3 LAB is designed with a red latch next to each axis for saving the balance positions when powering the gimbal off for storage or battery swaps. When powered back on, the gimbal returns to its balance positions. This way you won't have to rebalance it every time you power it on. Via a Wi-Fi connection to an iOS/Android phone or tablet, the CRANE 3 LAB is capable of wirelessly transmitting your video recording to your mobile device as a 1080p image in real time. The CRANE 3 LAB's ViaTouch Control System consists of a variety of controls that come up on the ZY PLAY app and allow for framing shots, controlling certain gimbal movements, and adjusting camera settings. The TransMount Quick Release Baseplate from Zhiyun-Tech is designed to let you easily move your camera between the gimbal and the TransMount Multifunctional Camera Belt or Gimbal Bag. On one side, the baseplate accepts the mounting plate of the WEEBILL LAB, Crane 3-Lab, or Crane 2, and on the other side it features a latch that lets you attach onto the straps provided on the outside of the belt and bag. In this way, when you pack away your gimbal or put it away temporarily, you can keep the camera handy without having to remove the gimbal mounting plate. The latch, which is made of metal, securely locks when you push it in and unlocks at the press of two pins on the sides. The Zhiyun-Tech TransMount Telescopic Monopod with Locking Buckle is designed to work with the optional TransMount Multifunctional Camera Belt to support handheld gimbals. The belt features a quick release socket that the monopod secures into. A quick release anchor point included with the belt screws into the bottom of the monopod and allows the monopod to pop into and out of the belt's socket, which has two spring-loaded quick release pins. Together, the monopod and belt take the weight of the gimbal off your hands and allow for comfortable jib-style shots. They also allow for easier control of the focus wheel offered on gimbals such as the Zhiyun-Tech WEEBILL LAB and CRANE 3 LAB. The Telescopic Monopod also works like any standard monopod and has a tripod base that allows you to push in and out with stability. It telescopes out from 18.5 to 47" and includes a removable rubber foot for setting it down on the ground without the tripod base. It has a comfortable sponge grip and includes a wrist strap that makes everything feel more secure in your hands. A supplied 1/4"-20 to 3/8"-16 screw adapter installs at the top of the monopod to provide you with either type of mounting point so you can mount gimbals, fluid heads, and other gear. 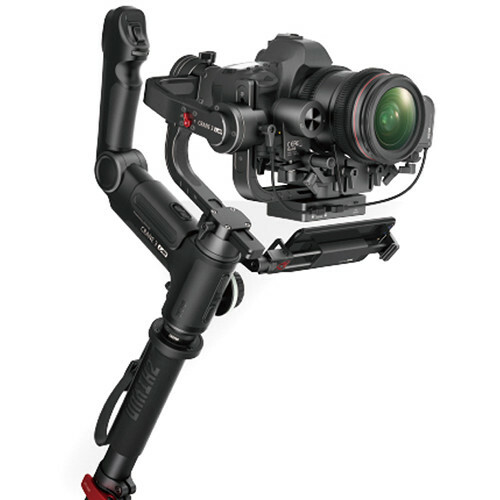 The Crane 3-Lab gimbal supports up to two motors at the same time. The Zhiyun-Tech TransMount Focus & Zoom Servo Combo Kit includes the TransMount Max zoom/focus servo and slightly lighter TransMount Lite focus servo. Together these two motors allow you to control both focus and zoom with zero latency. The motors attach to the bottom of the Crane's baseplate without any tools using just the included brackets, rods, and thumbscrews. The TransMount Quick Setup Adapter from Zhiyun-Tech is a quick release adapter for instantly attaching mini tripods and monopods to the Crane 3-Lab or WEEBILL LAB gimbal. It consists of two parts—one screws onto the tripod/monopod and the other to the gimbal's tripod mount, and the two simply click into each other. To detach them, you just need to pull back on a collar. The adapter prevents having to screw and unscrew a tripod/monopod each time. Featuring a 1/4"-20 male/female design, the adapter can also be used independent of the gimbal for various accessories, such as monitors. Two units are recommended for the WEEBILL LAB because the WEEBILL offers two locations for attaching a mini tripod—one on top and one on the bottom. With an adapter attached at each of the two locations, your mini tripod can easily be moved between one and the other to switch between standard and underslung modes. The Quick Setup Adapter features a robust aluminum construction. The TransMount Phone Holder with Crown Gear from Zhiyun-Tech is compatible with the Crane 3-Lab and WEEBILL LAB. It secures on the side of the gimbal and is adjustable to hold phones up to 6.3" wide when the phone is held in landscape orientation. It also articulates forward/backward and can be folded up when not in use. Designed to support the TransMount Mini and Telescopic monopods, the large-sized Zhiyun-Tech TransMount Multifunctional Camera Belt provides a point of stability for anything you mount on the monopod, including a gimbal. When the belt is used with a monopod and gimbal such as the WEEBILL LAB, the additional point of balance allows for substantially more stable and comfortable jib-type shots and lets you control the gimbal's focus wheel more easily. The belt also has military-grade strips along its length for hanging accessories such as lens bags and the TransMount Baseplate. For securing the monopod, the belt features a receptacle suspended on a hanging strap. The receptacle has a removable quick release 1/4"-20 mounting platform that screws into the bottom of the monopod and then pops in and out of the receptacle by quick release functionality. Two registration pins on the receptacle lock into a groove on the 1/4"-20 mounting platform to lock the two together. Box Dimensions (LxWxH) 18.5 x 16.25 x 5.25"
Box Dimensions (LxWxH) 4.0 x 3.0 x 0.7"
Box Dimensions (LxWxH) 18.6 x 4.1 x 3.7"
Box Dimensions (LxWxH) 12.6 x 9.2 x 2.55"
Box Dimensions (LxWxH) 2.75 x 1.65 x 1.05"
Box Dimensions (LxWxH) 5.3 x 2.5 x 1.1"
Box Dimensions (LxWxH) 6.3 x 5.0 x 3.3"
what is the torque spec on motors? The torque on the motors is not listed by Zhiyun-Tech. However the motors will be powerful enough to handle standard photography style lenses and smaller cinema lenses. If you are able to balance the lens on the Crane 3, the motors should have the power to pull focus.